I liked this book, but I was hoping to love it. Seriously, a modern retelling of Persephone has all kinds of potential for being extremely and darkly romantic. Enter Pierce Oliviera. Two years ago, Pierce had a near death experience and the darkly handsome ruler of the underworld claimed her as his own. Like Persephone, she escaped back to the world of the living where….well, let’s just say she didn’t cope well with her brush with mortality. Fast forward a couple years to present day and Pierce has endured endless hours of therapy, has probably swallowed the equivalent of a pharmacy full of pills, has made herself a social pariah in the eyes of her old classmates, has gone through her folk’s difficult divorce, and has moved to back to her mother’s childhood home, an island in the south of Florida, in an attempt to make a new start and to forget about her would-be captor who keeps popping up at the most inopportune times to save her. Turns out she’s moved right into her worst nightmare’s backyard. Oh where to start…oh let’s start with Pierce and John, but Pierce first. Pierce bugged the snot out of me. True, she had gone through a very traumatizing experience, and it’s understandable that someone might come out of a near death experience drastically changed. But the events that happened in the Underworld; where John, the ruler of the Underworld, (yes…JOHN…we’ll get to his name in a minute) claimed her as his own to stay with him forever, weren’t as terrifying as she built them up to be. True, she was 15 at the time, and I can understand how at that age a forever commitment could seem frightening and daunting, but she was DEAD and it’s not like he was being a monster about it. He wasn’t trying to trap her. Pierce unjustifiably vilifies John throughout the book, thinking he’s out to get her when really, though I wouldn’t go as far as calling him sweet, he’s only looking out for her and really does care about her well-being. Maybe she vilifies him to ease her own conscience for leaving him the way she did. Pierce is a shallow, an unintelligent, a somewhat selfish character, who lives in a state of stubborn, constant denial. And I just wanna shake her. John, despite having the least terrifying moniker for a death deity ever, is a pretty intimidating guy. Like I said, not warm and fuzzy by a long shot, but he really does love Pierce for some reason that I can’t decipher and protects her from those who mean her harm. You learn tidbits about John and his background throughout the story and I believe his name is an attempt to make him a more sympathetic character. I really did like John, and he came off as this patient, slightly frustrated, yet long-suffering character as he endured the unstable, emotional Hurricane Pierce. I wish that he and Pierce had had a few more scenes together, because if you totaled up all the time they spent together throughout the book, it probably encompasses about an eighth of the book, maybe less, this includes flashbacks AND present day. The mystery was interesting. You had some really interesting aspects of the story that made you wonder how everything was going to come together but when you finally reach the pivotal climactic event unfortunately it just fell flat. I really liked who the villain turned out to be, but how Pierce figured it out felt really contrived; just really bad clues. And for a girl who couldn’t tell from pretty obvious signs that the dark and brooding Lord of the Underworld was madly in love with her, how the heck did she manage to piece together the final conclusion from such random and insignificant details? <sigh> Who knows. Complaints aside, It was interesting. I liked it just enough to want to read the next one in hopes of it surpassing Abandon. I can’t tell you how many times I have picked this book up, tempted to buy it, then put it back. You and I tend to have similar interests in books. I think I’ll wait for the price to drop, or for a giveaway. I completely agree with your review. I wanted to love this book, but it took me a while to get into it. And even then, I kept waiting for the oomph. Still enjoyable, but just lacking that something. Waiting for the oomph. Yeah, I think Cabot had a really interesting concept. I think if Pierce has simply been less annoying, if there was a valid reason for her to fear John so much, then it could’ve really worked for me. I <3 this book and dont know what u guys r talking about! Had all the oomph in the world!!!!! It was kinda confusing at first though… Really recommend it!! Well, I’m glad you enjoyed it! I just couldn’t get into it as much as I wished I could’ve…obviously…lol. It’s a shame you didn’t love this one. I’ve been meaning to read it for a while now but I’ve never got round to it. I read this book and I loved it. The only part of it that I didn’t like was that it mention several things before we were told about them. But still, loved the book. Glad you enjoyed it Tayte! YES. This is the best review of Abandon I’ve read so far – you have it spot on! WTH is w/ his name? And I also had no idea why he thought she was the one. Did I miss something in my reading of it? Thank you Sophia! His name… based on the background of him that Cabot gave, I think it was an attempt of making him a more sympathetic character, an everyman. And I have no freakin’ clue as to your second question. If there was a reason given, I must’ve missed it too. I love Meg Cabot and her previous paranormal series are among my favorites ever! I’ve thought about trying her Princess Diaries books, because I thought the movies were really cute…. 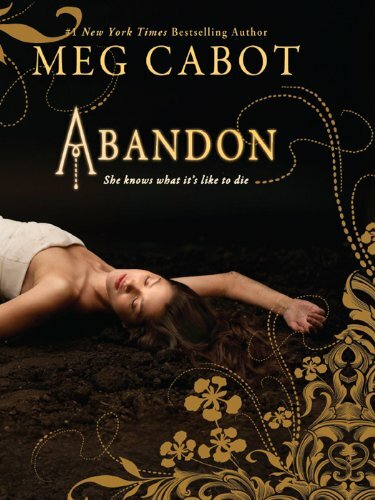 but I’ve read two of Meg’s books, Insatiable and Abandon and I think it’s her writing style that gets me. I like her books ok, but I don’t love them. Those two books just seemed really underdeveloped for what I prefer, and in talking to Heather about Jinx, it kinda sounded like that one was too. BUT that’s just my opinion and I’m glad you love her books… I think I’m kinda in the minority regarding Meg Cabot … lol. I really liked this one a lot. But I found myself turning the next page at the ending, I felt there should be more. Lol. Yeah… I didn’t expect it to end when it did either. Glad I wasn’t the only one Thanks so much for checking out my review! I’d so wanted to love this book. I’d had finished The Goddess Test and i’d so loved it that i was getting mad for another persephone kinda story. Abandon had got my hopes up since i’d really like the plot. But you’re right, it did somewhere fall flat. I mean what kind of name is John? Though i really like Pierce’s name for some unknown reason but, yeah, she was really a shallow character. I mean you’d have to be stonehead to not know when a hot, damned is in love with you. And where the hell do you get clues to know that your grandmother killed you. It kinda came of its own accord and all the while i was thinking where was anything like it mentioned. Plus, I think at 15 you’d totally vilify a person who tells you that you’re dead but after two years you need to get over it. Seriously when someone like John (really, whats with the name) is involved. Though i didn’t love but i still really liked it and am looking forward to read Underworld. * Mistake: I mean you’d have to be stonehead to not know when a hot, damned GUY is in love with you. Great review. I was expecting more from Meg since I loved her other books. This is one I’ve been on the fence about buying so maybe I’d better just get a copy from the library. Very nice review. I’m looking forward to reading it. I usually love Meg Cabot she’s one of my favorite YA authors:) And i LOVE Greek mythology so i thought this book would’ve been AMAZING…umm maybe not. I guess i just have to read it myself and see. LOL… well, if Meg is one of your favorites then you should definitely pick it up for yourself. I’ve discovered that my reading preferences just don’t mesh with Meg’s style… so there’s a very good chance you might think this book is amazing if you love Meg Cabot Thanks for stopping by Jenny! This has been on my TBR list for a while now, and I almost picked it up over the weekend. I have to say I didn’t read past your spoiler alert, just in case, but I was really hoping to hear you loved it. I’m hearing a lot of mixed reviews on it… some loved it, some felt more like you did. I’m thinking I may still give it a chance. We’ll see. Thanks for the review! I really liked Abandon. I also liked the fact that John wasn’t warm and fuzzy since he was a death deity. I agree that his name is a bit… plain… for a death deity, though, haha. Great review! I liked this book, but it is not my favorite mythical book of this story. John was too hard to like for me.